Amid Brexit and protectionist moves by President Trump, many observers are warning about the negative effects that a rise in trade barriers could have on growth. This column first highlights the important role acquired by deep-water ports as main hubs for trade during 1995-2007 and how they have allowed countries to gain from trade. It then shows that becoming embedded in global value chains is a powerful determinant of growth, even if it implies that a growing share of gross exports represents value added that has been produced in foreign countries. The recent protectionist moves by President Trump and the Brexit negotiations have revamped the debate about the benefits of trade. Many observers are warning about the negative effects that a rise in trade barriers could have on growth, especially on the grounds that national economies have become deeply connected through global value chains (GVCs) (Blanchard 2017, de Gortari 2018, Dhingra et al. 2017, Head and Mayer 2016). Yet, we still know little about the growth implications of GVCs. Indeed, none of the available studies investigating the causal effect of international trade on growth focuses on this issue. As production processes are sliced up across different countries through GVCs, the gross exports of any country embody an increasing share of foreign value added. Moreover, there is substantial double counting in trade figures, as intermediate inputs cross borders multiple times before consumption takes place. Finally, countries are different in the extent to which they participate in global value chains, and also in their positioning within them, i.e. from assembling to more upstream stages of the production chain. In a recent paper (Altomonte et al. 2018), we set out to investigate the implications of these phenomena for the trade-growth nexus. We focus on the pre-crisis period 1995-2007, which has witnessed a rapid expansion of GVCs (Johnson and Noguera 2017, Timmer et al. 2014). We develop a new instrument for gross trade and for the different value-added components of exports. To this purpose, we exploit the transportation shock provided by the sharp increase in the maximum size of container ships. We find that trade has a positive effect on growth. Most importantly, we show that the effect of exports is crucially moderated by differences in their value-added composition. In particular, we find evidence of stronger export effects on growth for countries that upgrade their positioning or improve their participation to GVCs more than others over time. Assessing the causal impact of trade on growth is a notoriously difficult exercise due to the endogeneity of trade. For instance, countries whose income grows more for reasons that are not related to trade may still engage in more trade. Several instrumental variable strategies have been adopted in this context. In line with the most recent studies (Feyrer 2019, Pascali 2017), we construct our instrument for trade by exploiting a shock to transportation technology that has an asymmetric impact across different bilateral trade flows. As a shock, we exploit the fact that the maximum size of container ships has more than tripled over the sample period, from about 5,000 to 15,500 TEU (twenty-foot equivalent units, corresponding to one standard container) (see Figure 1). This technological shift has been a game changer for the transportation industry, allowing for substantial economies of scale. 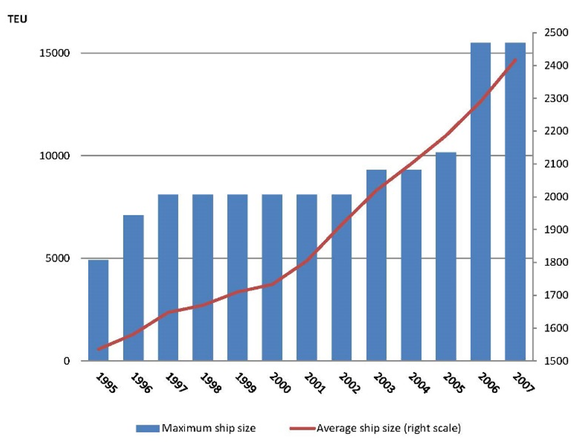 The new larger ships available have been widely adopted, leading to a rapid growth in the average capacity of the world container ships fleet, which has increased by 60%, from about 1,500 to around 2,400 TEU (see Figure 1). As a result, containerised trade has been the fastest growing modality of seaborne trade over the sample, ultimately accounting for about 40% of total trade (IMF 2012). This transportation shock has affected different trade flows asymmetrically, depending on the cross-country presence of deep-water ports, i.e. ports with a water depth of at least 16 metres. In fact, the new larger ships have a bigger draft and therefore can only enter deeper ports, which are unevenly distributed across countries. As a result, in a relatively short time, a restricted group of pre-existing deep-water ports has become increasingly central for global trade. In particular, in the sample of 40 countries in the World Input-Output Database (WIOD) that constitute the main focus of our analysis, we have identified only 47 deep-water ports with a container terminal where all the new ships introduced over the sample period could operate. Our baseline analysis involves regressing the GDP per capita of the exporting country on its exports. We construct our instrument by predicting export flows from gravity estimations that include the product between the time-varying maximum size of container ships available in the market and the time-invariant number of deep-water ports in each partner country (normalised by the length of its coast). The basic intuition is that, as larger ships become available, countries export relatively more towards partner countries that are more endowed with deep-water ports. The identifying assumption is that, conditional on controls, the presence of deep-water ports in partner countries – combined with the increase in the size of container ships – affects domestic GDP in the exporting country only through the trade channel.1 We allow the impact of the shock to be different across industries, as containerised trade has not the same relevance in all industries (Bernhofen et al. 2016). Moreover, we allow for heterogeneity across country pairs based on bilateral characteristics such as distance, as containerised trade is more cost effective at longer distances (Coşar and Demir 2018). Our baseline gravity estimates imply that for a country like Germany, which has 3,624 kilometres of coast, one additional deep-water port would be associated, on average, with an increase in yearly exports directed to the country by around 4.7%. This is far from negligible. We find that gross trade has a positive effect on GDP per capita, both in levels (with an elasticity of around 0.3) and in growth terms. We obtain similar results both when focusing on the 40 countries included in WIOD (2013 Release), for which gross exports can be decomposed thanks to the availability of harmonised input-output tables, and when enlarging the sample to all countries worldwide for which trade and GDP data are available. We also provide evidence on the microeconomic channels behind this effect, in terms of productivity growth and capital deepening. Specifically, we detect a positive effect of trade on both value added and capital per worker, not only at the country level but also at the industry level. To investigate the role of GVCs, we decompose gross export flows in their different value-added components, using the methodology of Wang et al. (2013). We obtain a specific instrumental variable for each component by running separate gravity estimations. We show that differences in the value-added composition of exports matter in moderating the effect of trade on income. As a first step, we consider separately the domestic and the foreign components of gross exports. Intuitively, one could expect a lower trade elasticity of income in contexts where foreign value acquires a more prominent role as a share of total exports, since the foreign component of exports is not directly related to domestic activities that would contribute to GDP in the exporting country. As expected, we find that the elasticity of income to exports decreases with the share of foreign value embodied in a country’s gross exports. Yet, this is not the case when the growth of foreign value reflects a significant (above the median) increase in participation or upgrade in positioning within GVCs. In such contexts, indeed, exporting foreign value seems to generate higher positive spillovers for the domestic economy, as stemming from the enhanced involvement in GVCs. Specifically, as a proxy for participation we consider the ratio between the foreign component of pure double counting and the total foreign value of exports (Wang et al. 2013). An increase in this ratio indicates the deepening of cross-country production sharing, with the exporting country getting more embedded in global value chains. As a proxy for positioning, we take the ratio of foreign value added embodied in intermediates over the total foreign value of exports (Wang et al. 2013). An increase in this ratio captures the fact that a country is upgrading its industries to start producing intermediates that are exported to other countries for final goods’ production. For each indicator, we compute the change at the country level over the whole sample period, from 1995 to 2007. We instrument such changes using variations in the corresponding ratios based on predicted trade flows, as obtained from the component-specific gravity estimations. Our results have important policy implications. First, they suggest that the positive effects of trade on growth remain relevant and are not necessarily weakened by the expansion of GVCs. Getting embedded in global value chains seems to be a powerful determinant of growth, even if it implies that a growing share of gross exports represents value added that has been produced in foreign countries. Moreover, exports have a positive effect on GDP growth even for countries that are not displaying substantial upgrades in positioning within GVCs over the sample, although climbing the value chain results in growth premia. Second, investing in physical infrastructures to facilitate trade seems to be key. Our results highlight the important role acquired by deep-water ports as main hubs for trade over the sample period. In light of our findings, the widespread investments observed in more recent years for the creation of new deep-water ports appear as a well-motivated and important step for trade facilitation and growth. Altomonte, C, L Bonacorsi and I Colantone (2018), “Trade and Growth in the Age of Global Value Chains”, Baffi-Carefin Working Paper 2018-97. Bernhofen, D M, Z, El-Sahli and R Kneller, (2016), “Estimating the Effects of the Container Revolution on Worlds Trade”, Journal of International Economics 98: 36-50. Blanchard, E J (2017), “Renegotiating NAFTA The Role of Global Supply Chains”, in Economics and Policy in the Age of Trump, Ed. C. Bown, VoxEU.org Book. Brooks, L, N, Gendron-Carrier and G, Rua (2018), “The Local Impact of Containerization”, Harvard University FEDS Working Paper 2018-045. Coşar, A K and B Demir (2018), “Shipping Inside the Box: Containerization and Trade”, Journal of International Economics 114: 331-345.
de Gortari, A (2018), “Disentangling Global Value Chains”, Princeton University and Dartmouth College, mimeo. Dhingra, S, H, Huang, G I P Ottaviano, P J Pessoa, T Sampson and J Van Reenen (2017), “The Costs and Benefits of Leaving the EU: Trade Effects”, Economic Policy 32: 651-705. Feyrer, J (2019), “Trade and Income – Exploiting Time Series in Geography”, American Economic Journal: Applied Economics, forthcoming. Head, K and T Mayer (2016), “Reversal of regional trade agreements: Consequences of Brexit and Trumpit for the multinational car industry”, VoxEU 12th November. IMF (2012), World Economic Outlook, International Monetary Fund. Johnson, R C and G Noguera (2017), “A Portrait of trade in value-added over four decades”, Review of Economics and Statistics 99: 896-911. Pascali, L (2017), “The Wind of Change: Maritime Technology, Trade, and Economic Development”,American Economic Review 107: 2821–2854. Wang, Z, S J Weu and K Zhu (2013), “Quantifying International Production Sharing at the Bilateral and Sector Levels”, NBER Working Paper 19677. Had we used the number of deep-water ports in the exporting country, one could wonder that those ports could be having an effect on domestic growth through channels other than trade, for instance by stimulating more domestic investments in infrastructures (Brooks et al. 2018). In the paper, we discuss a number of robustness checks where we consider also the role of deep-water ports in the exporting country, with fully consistent results. In any case, our identification strategy does not necessarily hinge on the joint presence of deep-water ports both in the exporter and in the partner country, as the transportation shock may have an impact on a country’s exports independently on its type of sea access. To view the original paper in its entirety, click here. Copyright © 2019 VoxEU. All rights reserved.